Can there be God-conscious organizational behaviour in the real world of today’s capitalist corporations and the alternatives? In this overview of God-consciousness as a moral-awareness model of preference formation, functions, structures, and programs of organization within the purview of institutions and society, the authors explain and compare the major ethical issues of organizational behaviour and structure in Islamic economic theory and application. 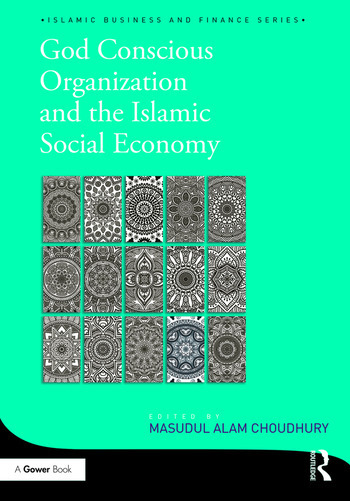 By analysing the nature of inclusive organizations and institutions, and the ethical preferences in Islamic choice framework, the authors from Saudi Arabia, Australia, Malaysia, Bangladesh, Canada, Indonesia and the UK, can highlight individual aspects to show whether capitalist organizational behaviour is sustainable. They describe how The Tawhidi epistemological framework governing conscious moral decision-making by institutions and organization, are used to establish the meaning and potential application of the concept of sustainability, and whether organizational moral objectives achieve their goals of life-fulfilment development, Poverty alleviation and the equitable distribution of wealth and resources. Contents: Introduction, Masudul Alam Choudhury; Contrasting epistemologies of organizational behaviour, Masudul Alam Choudhury; Religion inspired business, Gregory MacLeod; The Tawhidi methodology with implications in Islamic economics as an embedded socio-scientific system: contra-Islamic neoclassical reasoning, Masudul Alam Choudhury; Equitable distribution of wealth and resources in Islam, Ruhul Salim and M. Zakir Hossain; Evolutionary learning organization and the social economy, Masudul Alam Choudhury; Shari’ah and the world-system, Masudul Alam Choudhury; Ethics in evolutionary learning models: a critique of comparative perspectives and the alterAboriginals applied to the wellbeing of Canadian Aboriginals: an extended application, Masudul Alam Choudhury; The nature of business social ethics in heterodox epistemological worldviews, Masudul Alam Choudhury; An organizational theory of human resource development and poverty alleviation, Masudul Alam Choudhury; Critical questions on Islamic financial institutions and their necessary transformation, Masudul Alam Choudhury; The impact of Islamic development financing on poverty alleviation in Indonesia, Masudul Alam Choudhury and Tatik Mariyanti; An empirical model of the Islamic pooled fund in the light of Tawhidi unity of knowledge, Masudul Alam Choudhury and Rifki Ismal; Simulating the estimated circular causation relations in unity of knowledge relating to poverty alleviation in Indonesia, Masudul Alam Choudhury and M. Shahadat Hossain; Conclusion, Masudul Alam Choudhury; Index. Dr Masudul Alam Choudhury is Professor and International Chair of the Postgraduate Program in Islamic Economics and Finance, Faculty of Economics, Trisakti University, Jakarta, Indonesia. He is a Visiting Professor at the Social Economy Center, Ontario Institute for Studies in Education, University of Toronto. Professor Choudhury is the pioneer in the field of the epistemological treatment of Islamic Economics and Finance over the past 35 years by way of his original works in this area. He is the Editor-in-Chief of the SCOPUS-listed and Australian ABDC JEL-catalogued journal HIJSE (Humanomics: International Journal of Systems & Ethics) currently in its 33rd year of publication. His works have been reviewed by the Times Higher Education Supplement, Economic Journal, Southern Economic Journal, Middle East Review and Journal of Economic Literature.